So many people want old coins for their collections, but the problem is many of them are so expensive. 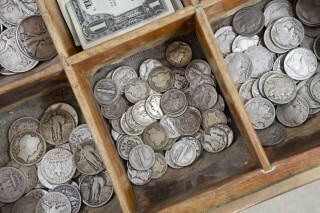 Some of America's early federal coins, which were first officially minted in 1793, are worth thousands of dollars each. So what's a collector on shoestring budget to do when he or she wants to buy examples of early American coins? Buy 1790s and early 1800s half cents and large cents – While many of the early American silver coins cost hundreds of dollars, it's possible to buy well-circulated examples of early 1800s half cents for less than $100. At that same price point, one can buy well-worn large cents from the late 1790s and early 1800s. Consider buying cull (damaged) silver coins – Collectors who want examples of America's early silver coins, such as Draped Bust half dimes, dimes, quarters, half dollars, and silver dollars, should think about buying damaged specimens. Examples of damaged coins include those with holes, bends, deep cuts, or post-Mint alterations. They may not look pretty, but they're no less historic relics from the U.S. Mint's early years and can be had for a fraction of the price of undamaged coins. Look for bulk auction lots with old U.S. coins – Sometimes, collectors can get great deals on old coins if they buy them as part of a larger collection of coins. Buying coins from bulk lots doesn't always mean you'll save tons of money on purchasing old coins, but oftentimes this does help a collector (or coin dealer) snag some nice old U.S. coins for a lower price than he or she might pay if buying those same old coins individually. One of the best ways to find bulk lots or entire collections is to peruse the listings for online auctions, estate sales, and traditional auction events. No matter how you go about looking for inexpensive old coins, be sure that whatever you're buying is authentic. While it's possible to score a nice deal on old coins, beware of opportunities that simply seem too good to be true. If something doesn't look right about the coin, or the deal just "feels wrong," then by all means pass up the offer. There will be other chances to find authentic old coins for reasonable prices.